The START-STOP system (hereinafter referred to just as the system) reduces fuel consumption and polluting emissions and CO 2 emissions by turning the engine off, e.g. when stopping at traffic lights, and starting the engine again when moving off. Never let the vehicle roll with the engine switched off. The brake servo unit and power steering only operate if the engine is running. For the system-dependent automatic engine shutdown to operate, the following conditions must be met. The driver's door is closed. The driver has fastened the seat belt. The driving speed exceeded 4 km/h after the last stop. Some additional conditions for the system to function cannot be either influenced or recognised by the driver. Therefore, the system can react differently in situations which are identical from the driver's view. the conditions for automatic engine shutdown are not met. Running the engine is essential, for example, for the following reasons. The engine temperature for the proper function of the system has not yet been reached. The charge state of the vehicle battery is too low. The current consumption is too high. High air-conditioning or heating capacity (high fan speed, big difference between the desired and actual indoor temperature). If the vehicle remains outdoors for a long time in minus temperatures or in direct sunlight, it can take several hours until the internal temperature of the vehicle battery reaches a suitable temperature for proper operation of the START STOP system. If the driver's seat belt is removed for more than approx. 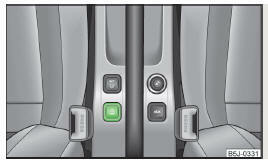 30 seconds or the driver's door is opened during stop mode, the engine will have to be started manually. After manual engine start, the automatic engine shutdown can take place only when a minimum distance required for the system function has been covered. In compliance with the operating conditions, automatic engine shutdown / automatic engine start takes place as described. Shift the gear lever to Neutral. The automatic start procedure takes place again. The vehicle has begun to roll, e.g. on a slope. The brake pedal has been actuated several times. Press the button » Fig. When start-stop mode is deactivated, the warning light in the button lights up. If the system is automatically deactivated when the engine is turned off, then the automatic start process takes place. 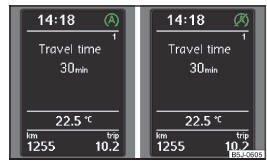 The messages and information are shown in the instrument cluster display. One of the conditions for automatic engine start is not satisfied or the driver's seat belt is not fastened. The engine must be started manually. A system error is present. Seek help from a specialist garage.